Or just stop worrying about the line breaking. 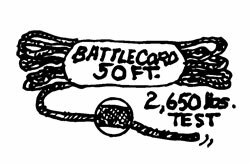 Battlecord is skinny but megatough stuff. And this one is a 50-foot length of black cord rated for 2,650 lb test. Measures 1/4” dia with a 7-strand core and is rot, mildew and UV resistant. Made in the USA for Atwood Rope. 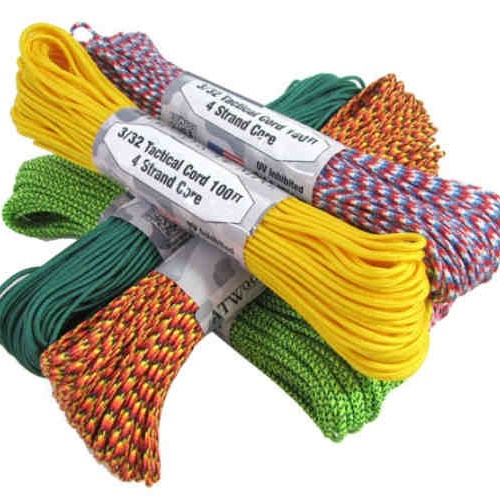 Our each is 100 feet of of paracord (tactical cord) from Atwood Rope Mfg. 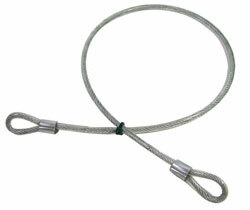 Measures 3/32" dia (think round shoelace) with (4) internal strands and a 275-lb test strength. UV inhibited; rot and mildew resistant. In assorted solid and blended colors, from which we'll pick because we have impeccable taste in cordage. Bungeeish scrunchies. Whatever. 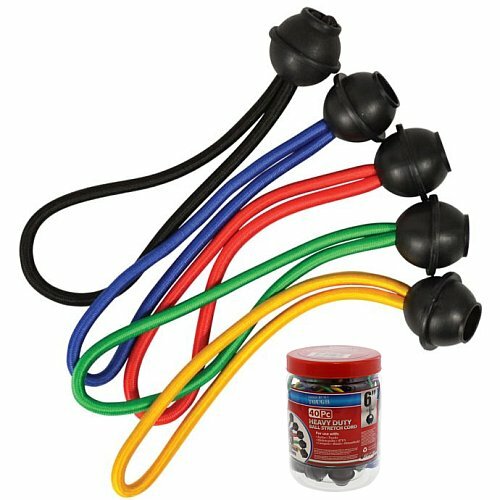 These here are heavy-duty elastic cords, with plastic balls where the two ends join. The 6” long loop can stretch to about double that length. Suitable for holding pretty much anything, including Samoan linebackers’ dreadlocks. You get a package of (40) in assorted colors including black, red, blue, green and gold. It's easier to see. 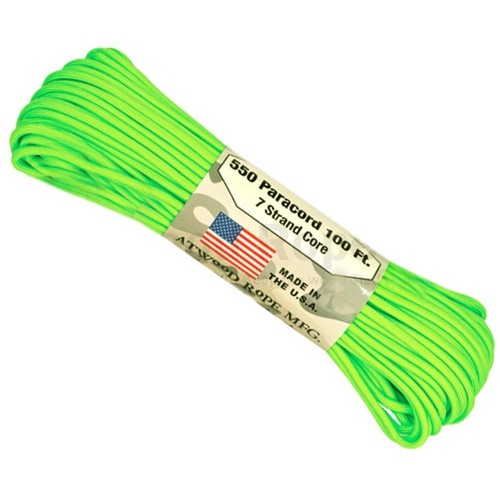 Our each is (100) feet of 3/32" dia high visibility neon-green type-III paracord. Made of 7-strand, 550-lb test nylon, it's color-fast and resistant to rot, UV light and mildew. A camper's dream! Also makes really snazzy bootlaces. 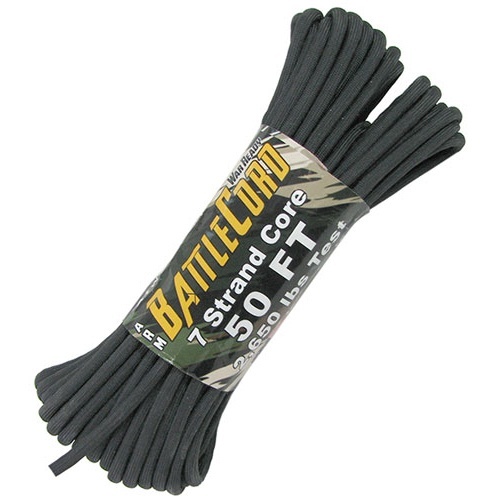 Micro tactical cord measures .046" (1.18mm) dia on 125-foot spools. 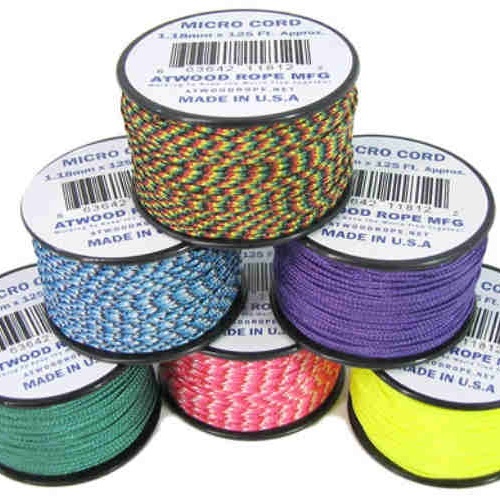 Made in the USA by Atwood Rope Mfg., it's UV and rot resistant with a 100-lb test strength. Lotsa solid and blended colors and we'll just grab (3) different-colored spools for you to save you the trip to our warehouse. 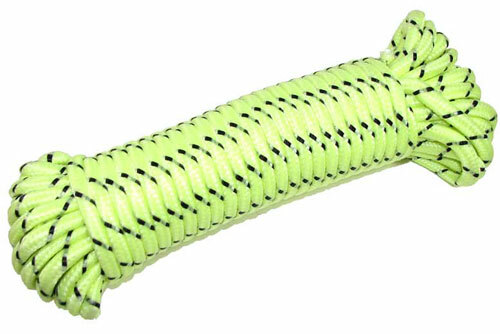 This braided polypropylene rope is 3/8” dia (rope size #12) and rated for a 100-lb working load. 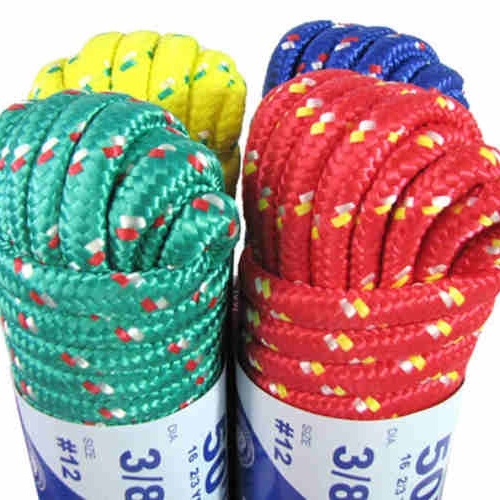 You get (50) feet of this easy-to-knot utility rope in assorted colors. Jute is natural, biodegradable twine from vegetable fiber, the same stuff they make gunny sacks and coffee sacks out of and used to make rug pads from before those cheesy foam liners took over. Perfect for craft projects and indispensable in the garden. In 300-foot rolls. We wouldn't use them to lock up the Harley, but these 30" long x 3/16" dia stranded-steel cables are prefect for light-duty applications. We'll pick a pair coated with clear, red, green or black vinyl, because we can. The end loops are 1" dia. Add a tiny padlock and they're belts for skinny hipsters. 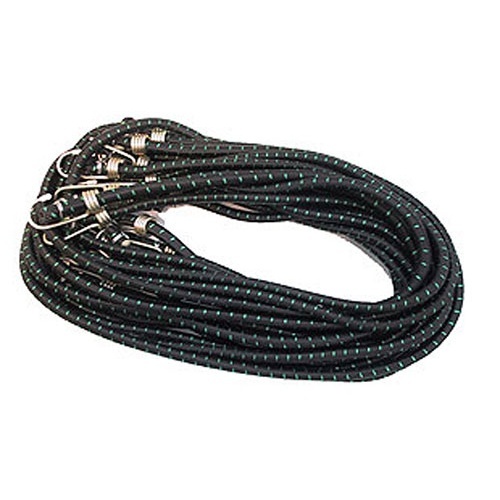 30" LONG STEEL CABLE 3/16"
Glow-in-the-dark rope is handy for midnight cowboys but can save your life on boats (it glows AND floats) and can keep you from tripping over tent lines on camping trips. You get (50) feet of 1/4" dia polypropylene rope with a 116-lb working load and a 350-lb break strength. Mfr says 3-4 hours in the sun gives you 5 hours of nighttime glow. 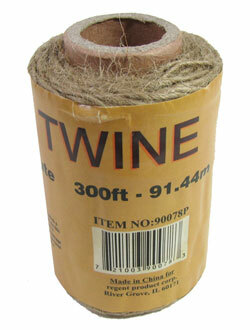 Don't you hate it when your twine rots? Us too. That's why we always use this mildew- and rot-resistant nylon twine for household repairs, gardening, boating, etc. 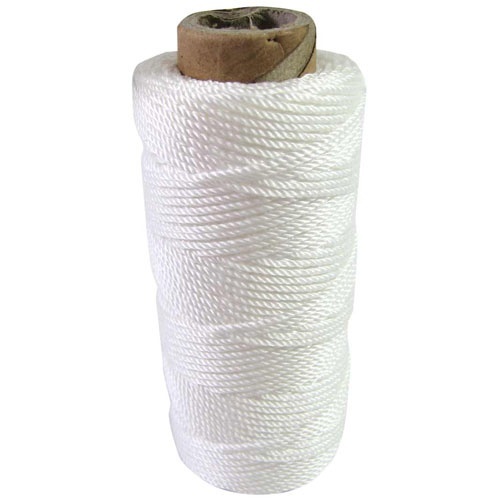 You get (3) 225-foot spools of white twine for a total of 675 feet. Stretches to absorb shock and resist breaking. Mega-bungee cords. Just the ticket for tying down motorcycles, refrigerators, or large marsupials. (Tie your kangaroo down, boys!) Our each is a package of (10) of these monsters, approx 1/2" dia x 6-feet long, (Yes 6 Feet!) in black with green accents (colors may change), with 1" x 2-1/2" hooks on both ends. That's almost 8-LBS of bungees and just under two bucks a piece. Outstanding!